First of all, I am going to share my personal experience with you. Today I have inserted my USB drive in a Public computer and what I have seen that the computer is infected with Shortcut Virus . I did not know that the Computer has shortcut virus. The more strange thing is that there is an Anti-Virus software is installed on that computer. But the anti-virus software is not doing its job. Then I have come to know that all files stored on my pendrive is now looking like a Shortcut and I can only access these files from the infected computer only. I can’t see any file from my Desktop.I was so much terrified because I had many valuable data and photos in that particular Pendrive. If you have the same problem, you can read this post. Insert the pendrive in a Linux based computer. You will be able to see those viruses in a Linux based computer. Now delete those files. If you or friends don’t have any Linux based computer then follow method two. After the virus attack I was so much worried because I did not have any backup copies of those files . Then I have used this simple method and It has made me relieved. So what I have done to fix this problem ? I am sharing my tip so that you can follow the same thing and fix this unwanted problem. The method I am going to share is very easy. You don’t need to use any complex CMD command . You just need to use a software named 7-ZIP file manager. This software is used to extract zipped files but we will use its file management feature so that those virus can’t execute their process as we all know that Explorer.exe will treat those shortcut things as legitimate. First download 7-zip file manager from here. 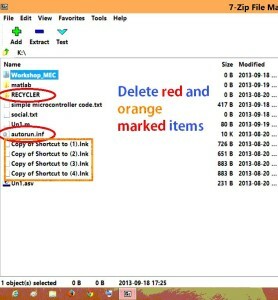 Delete those files marked as Red color and Orange color. Please be sure that there is not any virus files in the pendrive. There can be some problem if your files are hidden , then you have to change your setting from your control panel> Folder options > Select View tab > Enable Show hidden file and folders. Now you will be able to see your files in an empty folder. Now Press CTRL+A to Mark your files and folders and press copy on top of 7-zip. Now save them on anywhere in your Hardisk. After doing all of this Format your pendrive. You can also follow this method if your own computer is infected i.e. your harddisk is infected and delete all viruses by following this method. So, now mine and your computer is free from those shortcut viruses , now the question is , can we use any prevention measure so that no virus can attack our pendrive in future? TownScape USB Antivirus that was created primarily for Memory Sticks/Memory Cards (But not limited to) is a lightweight background antivirus software and it does not need to be updated everyday. It has its unique system of identifying Virus. This Antivirus has its own unique algorithm that is far better than the Traditional antivirus need-to-update method, which when not followed gives the user a false sense of security and makes his/her computer more vulnerable and thus spreads viruses even more. Since most viruses infect your computer through Memory Sticks/Cards, TownScape using their general modes of operation uses a blanket algorithm and probability to find viruses . This is not a virus scanner rather TownSpece USB Antivirus is a virus hunter. Top 10 Free ePUB readers for Windows/MAC/Linux you should not miss! As i read this article, i find it very informative. it is a nice one because it deals with an interesting ideas and information. I like it so much as from the first time i read it, the images that are used here attracted me a lot. They take my attention from the first look, so thanks so much for sharing with us this great topic in this great website. Just use task manager to end wscript.exe process and delete the shortcuts. Also search and delete the .vbs files with weird name in document and temp folder. Then in folder options uncheck all the hide options to view folder and files.